Muddy - Big "closed" sign blocking entrance. Don't ride in the mud! Isn't Utah beautiful - on the Draper Rim Loop. 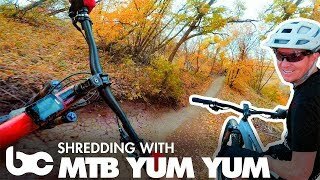 Checking out Corner Canyon with MTB Yum Yum. Traversing the Eagle's Crest Trail. Springtime wildflower line the trail.